Ever since Montgomery Ward introduced the first mail order catalog in 1872, consumers have enjoyed the option of shopping right from their homes. Following Montgomery Ward's lead, John Wanamaker, Rowland Macy, and Sears Watch Company also issued their own mail order catalogs, beginning a trend that has lasted until today. Some of these early mail order catalogs developed into well-designed publications offering a broad spectrum of home decor, apparel, and gifts. 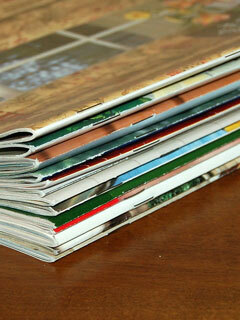 The reasons why the mail order catalog continues to be so popular among consumers is no mystery. Mail order catalogs make it easy to shop for just about anything. No more running from store to store looking for the perfect rug, sweater, or gift. Today you can find whatever you need, down to the last detail, from the comfort of your living room. Almost all of today's gift catalogs include descriptions and photos, so the consumer can see what the product looks like before ordering. Ordering can usually be done by phone, via a form included in the catalog, or on the Internet. Consumers generally have several different shipping options to choose from; once the order is placed, they can just relax and wait for the item to be delivered to their doorstep. How does one arrange to receive gift catalogs? If you have a credit card account at a store such as Macy's or Sears, catalogs will be sent to you regularly. A quick phone call to the company will get you on their mailing list. As the Internet becomes more widely used, more and more gift catalogs can be found in digital form, allowing Internet users from all over the globe to access their content and order products online. Here on our site, GiftCatalogs.us, you will find a selection of online catalogs that offer a wide array of gift merchandise. The gift and home industry's non-profit trade association strives to help and encourage vendors, sales agencies, retailers, and industry affiliates to work together. The GHTA is a place for members to connect, contribute, and learn. Features a unique and innovative collection of lifestyle gift products and luxury housewares. Offers handbags, neckties, jewelry, watches, gifts, and fine Italian designer fashions. This catalog is a convenient source for flowers, baby gifts, gift baskets, corporate gifts and gourmet sweets. Find a unique assortment of gifts on this gift shopping website and in Personal Creation's seasonal gift catalogs. Premier website for Irish-themed gifts, jewelry, apparel, and merchandise. This Los Angeles-based firm works with preferred floral and gift basket suppliers worldwide to deliver flowers, gift baskets, fruit baskets, Teddy bears, cookies, and chocolates. Whether you are giving a gift or entertaining family and friends, these quality gourmet gift offerings can make your gift-giving and entertaining more enjoyable. Find beef & cheese, fresh fruit, sweets & nuts, and a gourmet gift pantry. Offers value-priced gifts and home products; quality clothing for men and women. Your complete headquarters for corporate gifts, personalized gifts, and employee recognition awards. Gifts and Collectibles - online gift and collectible catalogs. Catalog Shopping - mail order and online shopping catalogs.